Photos from President Donald Trump’s inauguration Friday appear to show a much smaller crowd than the one at the Women’s March on Washington Saturday. A combination of photos taken at the National Mall shows the crowds attending the inauguration ceremonies to swear in President Donald Trump at 12:01pm (L) on Jan. 20, 2017, and President Barack Obama (R) on Jan. 20, 2009, in Washington. Since the National Park Service is barred from spending money to count crowds, we’ll never get an official tally of the crowd at either event. 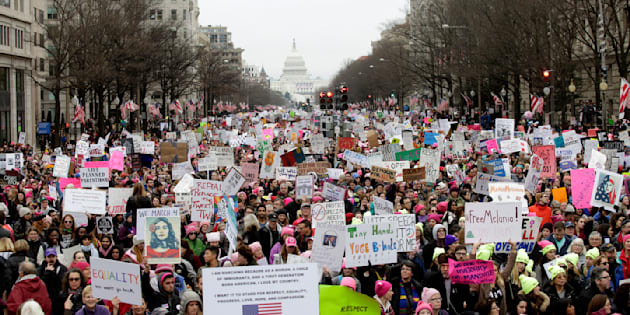 Women’s March organizers upped their crowd estimate from 200,000 to 500,000 after D.C.’s metro system became bogged down with attendees Saturday morning. They also altered the march’s route due to the size of the crowds.